KIA have announced their entry to the hot hatch market with the KIA pro_cee'd GT, a sporty three-door version of the brand's popular hatchback. AOL can reveal exclusive details about the new model, and the maker's intention of further sporty GT models.Although there are limited details currently available about the pro_cee'd GT, which is due to be revealed at Geneva in March 2013, AOL sources within Kia have unearthed details about the new hot hatch. Powering the three-door pro_cee'd GT will be the same 1.6-litre turbocharged GDI engine currently found in the Hyundai Veloster Turbo, but with more power. The pro_cee'd GT should have "around 200bhp" according to company sources. On sale in July priced at around £21,000, it will only be available with a manual gearbox and as a three-door, but company insiders added: "There will be a generous amount of kit included for that price, and a five-door version will follow at a later date." 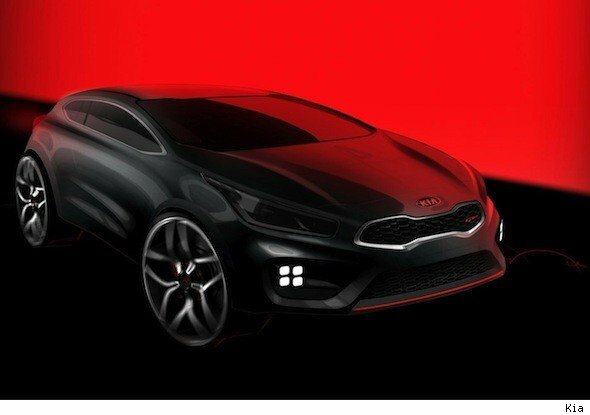 AOL can also reveal Kia's desire for more performance models in the range, but sources have said this is largely "dependant on the success of this new variant". Sources said: "We've seen what Ford and Renault have done with both their warm and hot hatch models, and we are aiming for the warm rather than hot hatch market with this model. "All of the Renaultsport models have critical acclaim but you don't see many on the road. Instead, you see more of the cheaper 'warm' variants, but we need to test the market with the pro_cee'd GT first." If successful, Kia will look at launching other GT variants of A- and B-segment models and could include a Picanto GT, which has not been ruled out.